OrgMassSpecR is an extension for the R statistical computing language. It contains functions to assist with organic/biological mass spectrometry data analysis. Mass spectral libraries are available as companion packages. This project is under continuous development. The stable version of OrgMassSpecR is on CRAN. The development version of OrgMassSpecR is on GitHub. The mass spectral library packages and stand-alone files (PDF reports and MSP files) are available on the GitHub Mass Spectral Libraries page. 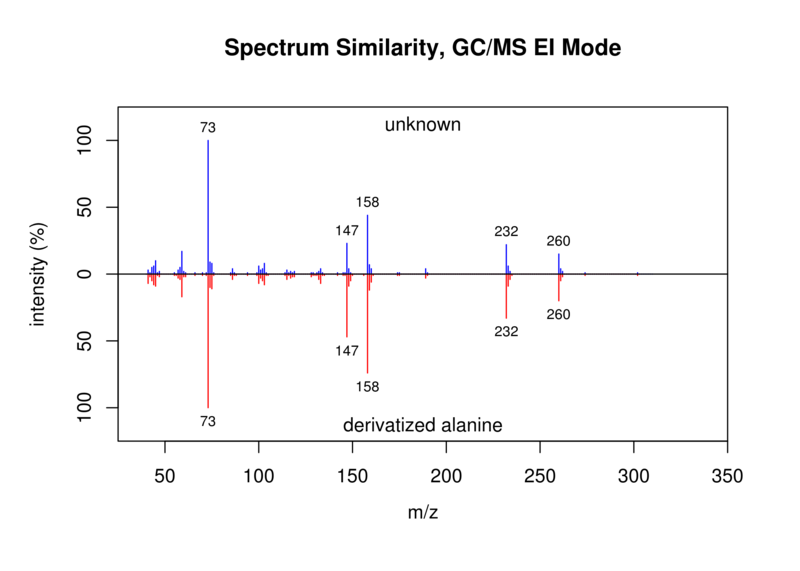 OrgMassSpecR examples are in the package vignette. MolecularWeight: Calculate the molecular weight of an organic molecule. MonoisotopicMass: Calculate the monoisotopic mass or monoisotopic m/z value of an organic molecule. IsotopicDistribution: Simulate the isotopic distribution of an organic molecule. ListFormula: Convert a character string representing an elemental formula to a list representing the elemental formula. DrawChromatogram: Plot a chromatogram, color the area under specified peak(s), and calculate the peak area(s). SpectrumSimilarity: Generate a head-to-tail plot of two mass spectra and calculate a similarity score. ConvertConcentration: Change the unit basis for a sample concentration, such as ng/g wet weight to ng/g dry weight, or pg/g lipid weight to pg/g wet weight. RetentionIndex: Calculate the the non-isothermal gas chromatographic retention index of a target compound. DeadVolume: Calculate the internal volume of a defined length of tubing. FlowTime: Calculate the time required for a liquid to flow through a defined length of tubing. LibraryReport: Generate a PDF report of an OrgMassSpecR mass spectral library, or view spectra within R. Each spectral library package has its own LibraryReport function. ReadMspDirectory: Reads in all .msp files within a directory and makes a single concatenated data frame of m/z values and intensities. ReadMspFile: Reads in a .msp file and makes a data frame of m/z values and intensities. WriteMspFile: Writes a single .msp file from a data frame of m/z values and intensities of multiple mass spectra. Digest: Cleave an amino acid sequence (a protein or peptide) according to enzyme specific rules and calculate the precursor ion m/z values. FragmentPeptide: Determine the b- and y-ions or c- and z-ions produced by the fragmentation of a peptide by tandem mass spectrometry. ConvertPeptide: Convert single amino acid codes to an elemental formula or three letter codes. PeptideSpectrum: Plot a peptide fragmentation mass spectrum, with the b- and y-ions or c- and z-ions identified. IsotopicDistributionN: Simulate the isotopic distribution of a peptide with varying amounts of nitrogen-15 incorporation. IsotopicDistributionHDX: Simulate the isotopic distribution of a peptide undergoing hydrogen-deuterium exchange. ExchangeableAmides: Determine the number of backbone amide hydrogens given a protein/peptide sequence. Used in hydrogen-deuterium exchange experiments. The characteristic isotopic distributions of bromine and chlorine atoms can aid the interpretation of mass spectra. 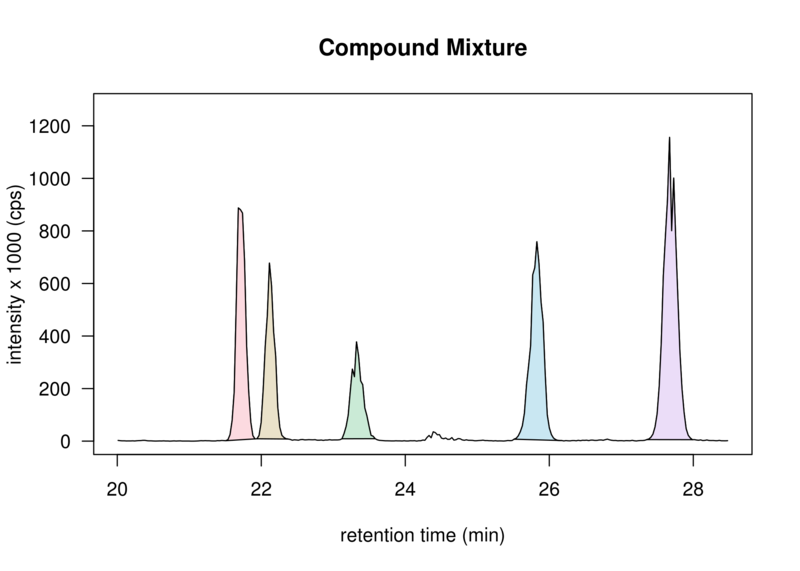 Simulated isotopic distributions of a peptide with varying nitrogen-15 incorporation. 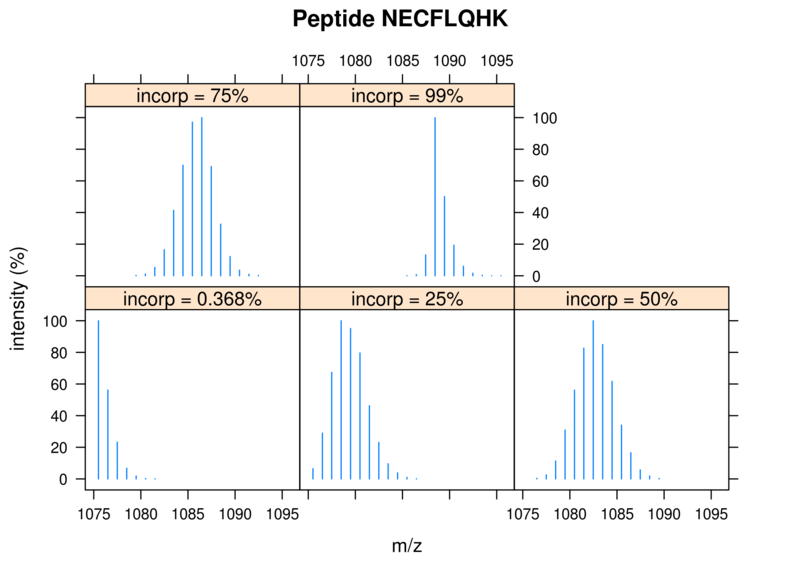 Function IsotopicDistributionN. Peptide fragmentation mass spectrum. 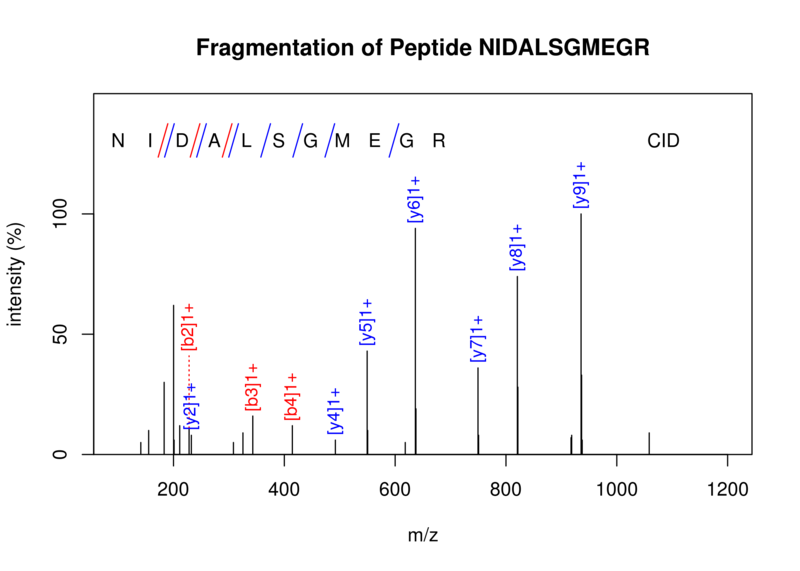 Function PeptideSpectrum.